Learn the secrets that make all the difference in rooting. Are you ready for an in-depth class on rooting your newborn baby's hair? 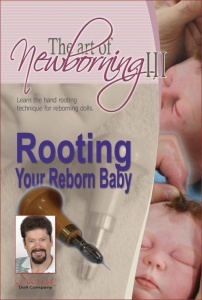 When rooted correctly everyone will think your baby must have grown the hair, it looks so real! This DVD explains how we get the newborn hair to look that way, what kind of hair we recommend, and what tools are used to achieve the best results. What are the differences in hair I can use? What fibers should I avoid and why? When should I root versus use a wig? What kind of needles are best and why? Do you root before you paint or after? How should I hold the needle? What can go wrong while rooting? Can I cut the hair? Can I root eyelashes and eyebrows? Many new hair styles since this DVD was made.Miss more examples. the Tinkerbell Creations DVD has a much more up to date hair section than the secrist DVD which is very basic stuff at a budget price.